A Walking Picture firm operated from here, with a painted wooden sign saying “Don’t forget your photograph! Osbert Corner, walking picture kiosk” seen in the background of some of these walkies (see enlargement below.) They operated with a converted movie camera, taking three consecutive frame walkie strips. The earliest I have seen is from 1929 and turned up quite recently; I have a dozen examples (though no complete strips) but few are dated, the latest is 1937, and none after WW2. All the examples are on generic ‘walking pictures’ paper with no company name. The woman on the right in the 1929 walkie is Mary, who (after cutting the frame out carefully) sent it to a friend with the enigmatic comment: “This is my, you know – “! Well no we don’t, but will not speculate! She is dressed in the fashions of the day, he in his suit and tie, plus pipe and box camera. Taken in October it does suggest walkie firms had a longer season than we might expect. Two ladies out walking their dog on the very same spot can be found on the site here. 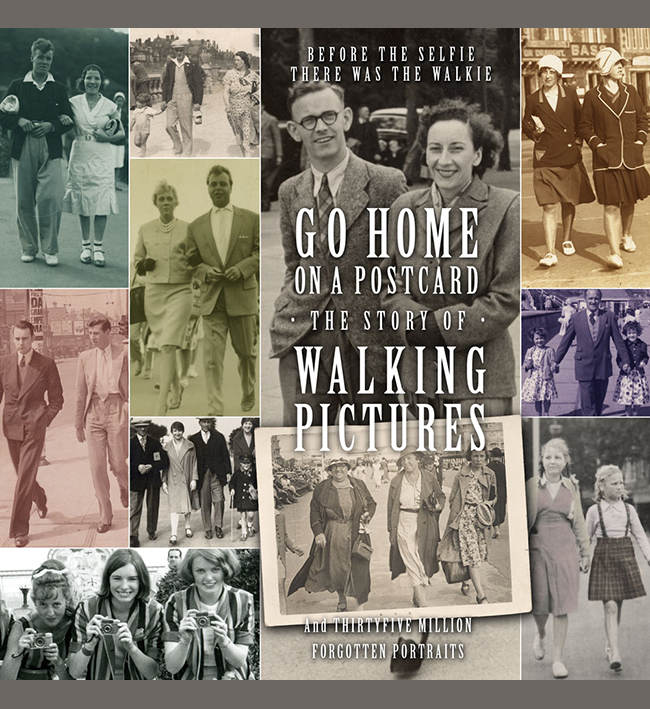 Osbert’s is covered in a full list of walking picture firms in the Go Home On A Postcard book. Osbert House became Butlins House and lasted through into the 1980s. What would be a great asset for any town was then torn down and replaced by tawdry modern amusement arcades.